White House Not On Dalai Lama's D.C. Tour The exiled Tibetan spiritual leader will not have a meeting with President Obama during his current American trip. The White House decided to put off such a meeting until after Obama goes to China in November. Human rights activists criticized the decision as kowtowing to Beijing. 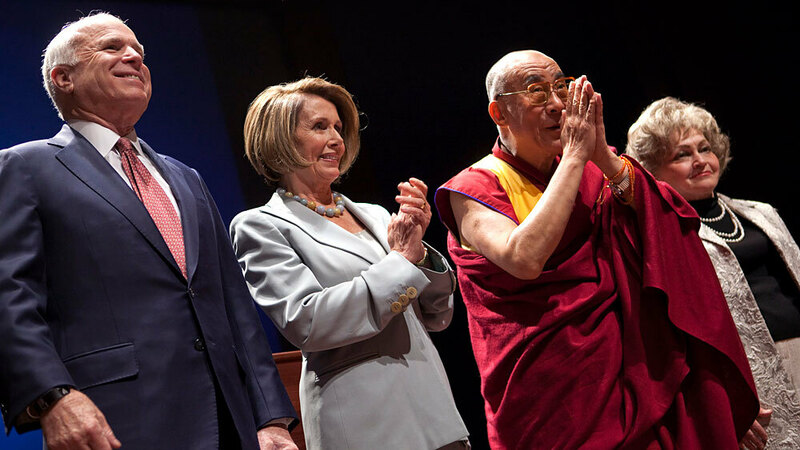 The Dalai Lama stands with Sen. John McCain (R-AZ, from left) House Speaker Nancy Pelosi (D-CA) and Annette Lantos, widow of California Rep. Tom Lantos, during the inaugural Tom Lantos Human Rights Prize award ceremony in Washington, D.C., on Tuesday. The Tibetan spiritual leader will not meet with President Obama during his trip to Washington. The White House says it was a mutual decision not to hold a meeting so close to the president's trip to China, scheduled for November. The Dalai Lama began his latest trip to Washington on Tuesday by receiving a human rights award and being feted by powerful lawmakers on Capitol Hill. But there was one big gap in his schedule. The exiled Tibetan spiritual leader will not have a meeting with President Obama. The White House decided to put off such a meeting until after Obama goes to China in November. The 74-year-old Buddhist monk, who fled Tibet 50 years ago, has accused China of a "rule of terror" in Tibet. Tibet was essentially autonomous for decades before Chinese communist troops entered in 1950. White House spokesman Robert Gibbs said it was a mutual decision not to schedule a meeting with the Dalai Lama so close to Obama's trip to China. Gibbs said that a strong relationship between the U.S. and China is in the interests of Tibet because it "allows us to talk to them about the cares and concerns of the Tibetan people." The Dalai Lama's envoy, Lodi Gyari, said in a statement that "our hope is that the cooperative U.S.-Chinese relationship that President Obama's administration seeks will create conditions that support the resolution of the legitimate grievances of the Tibetan people." The Dalai Lama didn't mention the lack of a White House meeting as he received an award in memory of the late Rep. Tom Lantos, a longtime champion of human rights who died last year of cancer. The Tibetan spiritual leader did, however, entertain the audience with stories of his past brushes with American presidents. Franklin Delano Roosevelt once sent him a letter, a signed photograph and a gold watch. He joked that he "developed an affection to America" because of that watch and brought it with him when he was given the Congressional Gold Medal at a ceremony with President Bush in 2007. The Dalai Lama says he is pushing for more autonomy within China. Beijing accuses the Dalai Lama of trying to split Tibet from China. Human rights activists have criticized the Obama administration for what they regard as kowtowing to Beijing and sending a signal that human rights are not central to the Obama foreign policy agenda. In an interview with NPR, the daughter of Lantos, Katrina Lantos Swett, noted that every president since 1991 has met with the Dalai Lama. "There's no time when reaching out to and welcoming the Dalai Lama doesn't irritate China," she said, adding that she hopes Obama will realize that sooner rather than later. Her father was the first to bring the Dalai Lama to Capitol Hill in 1987. The State Department tried to prevent that, according to the congressman's widow, Annette Lantos, who recounted the story in a video tribute at Tuesday's ceremony. "The State Department put a tremendous pressure on him to stop it, but of course, Congress is independent, and basically my husband could tell the entire State Department delegation to go fly a kite," she said. This time, the State Department sent its Tibet coordinator, Maria Otero, to watch the Dalai Lama receive the Lantos award.